Recently I came across an interesting article in the recruitment section of Tages Anzeiger, a Swiss daily newspaper. The article highlighted a new type of professional who have an excellent education and a solid work experience. Due to specific knowledge they are asked to help out in specific situations, in fact becoming independent contractors. The characteristic of such professionals is that they do not have a linear career but have tried different roads. They have excellent management skills and are well connected. What is very important to them is a meaningful job as they often have a vision they want to accomplish. This makes them harder and harder to employ in big organizations with rigid structures and frequent re-organizations. Or as Prof. Muhammad Yunus once said at a lecture: if you can’t find the perfect job, create it and become an entrepreneur. Interestingly, I think I know a couple of such “hybrid” professionals and maybe the current state of the economy accelerates this trend. Currently a few of my friends are dabbling with the idea of starting their own business. With Europe and America slowly toppling over under their debt burden, the Swiss Francs has become the currency of choice for scared investors again. The Swiss Francs has recently reached record highs towards the dollar, Euro and most other currencies. What is mostly bad news for the Swiss tourism industry is an unexpected boon for Swiss travelers as their appreciated Swiss Francs buys them more and more. MacBooks from Apple for example are between 20-25% cheaper in Malaysia than in Switzerland. A clear buy signal! Are you also playing the guessing game of how the various economies will develop? Will America fall back into recession (Japan just did)? Will China continue to grow at break-neck speed? How come that Germany is the only EU economy solidly growing? Luckily, Switzerland did not have a housing bust in 2008/2009 and we are back on the growth track. Almost. Over the course of the last few months I have been speaking to several dozens of people in business. The fields ranged from banking to hedge funds and from architecture to law firms. Interestingly everyone is singing the same tune: future anxiety. Despite a solidly growing Swiss economy, managers are uncertain about the future. It seems that everyone is afraid of making decisions. It is the time of the OTH-guy (on the other hand) who constantly sees the glass half empty. The cons of this behavior: procrastination and decision making angst. It doesn't matter if you are a banker, hedge-funds-start-up, architect or a lawyer. Clients love to procrastinate indefinitely. Everyone has ample time and would rather have another meeting, phone call or presentation. Everyone, of course, is interested in new products, ideas and hiring people. But no one wants to pull the trigger. No one. Employees who have jobs stay on. People on the look-out for jobs are faced with assessment periods of two to six months. And in rare cases when a decision is made, the speed changes from snail's pace to warp-speed. Patience turns into mania! Results need to show in months, or better still in weeks. The same person who spent months evaluating a decision suddenly wants to see results. They forget, Rome was not built in a day. Picture: An Indian group of school children visiting a palace. Traveling in New Zealand is a small world tour and gives a good insight into the new dawn of Asian tourism. Having dinner in a Queenstown restaurant can be a truly international experience: the cook is Kiwi, the waiters are French, Belgian or Spanish and the guests German, Dutch, Israeli or Indian and Chinese. However, the biggest growth in New Zealand tourism nowadays hails from China and India. With increasing wealth after the war Europeans started to travel, so do Asians today. Tourists in Auckland, Queenstown and Taupo hail from a new and affluent middle-class. Take the Chinese for example. According to an article “A new grand tour” by The Economist they love to visit the Château Lafite Rothschild, Paris and Nice in France, Lucerne in Switzerland, Trier and Metzingen in Germany because of the Karl-Marx-Haus and the Hugo Boss outlet and Monaco for gambling. Shopping is also very high up on the list as luxury goods in Europe are cheaper and certainly not fake. Apparently Chinese tourist reserve a third of their budget for shopping. This also explains why New Zealand cities are planning to expand their shopping big time. Asian tourists in New Zealand prove that the next natural step after herded group tourism is individual tourism. So better get prepared, Museum Europe! Picture: Those were the good old days when crisis created real smoke (the Esplanade celebration in Geneva). Switzerland seemed to have avoided the global downturn for the longest time. Not any longer, should one believe the gloomy predictions by various researchers and market oracles. With a slump in the export and manufacturing industry the global recession has finally found Switzerland (we are tiny, you know). The reason for this recession is the global financial and economical crisis that has been going on for two years. It originated in the USA and one of the key ingredients of the crisis is cheap capital and debt. Should you wonder how everything is connected I can strongly advise to watch this movie sponsored by one of the partners of the private equity group Blackstone, Mr. Peterson. Be scared! With a big recession on the plate companies worldwide have to slim down and lay-off staff. Switzerland has been spared to recently by the effects of the recession but restructuring is now also going on here. The big question is if Switzerland will face only a mild recession or a severe depression as the USA and UK. With the first people being fired, formerly ‘dull’ professions like teacher, police officer or clerk get a popularity boost in Switzerland. At the same time international companies are hunting for “hungry 25- to 35-year-olds who are willing to travel”, according to The Economist. For mobile expat workers in Switzerland this could mean new opportunities abroad. Picture: Zurich might seem sometimes like "hell" to expats. The recession is here and according to Credit Suisse it is even a depression. Anyone who has recently been to Britain has witnessed sales with discounts up to 90 percent and retailers going bust. Another sign is the newest copy of Wallpaper magazine that is much lighter because of less advertisement (same applies to Vogue, Elle etc.). With Christmas Sales still very strong recession hit Switzerland just very recently. The first lay-offs are underway. Switzerland historically boasts a very low unemployment rate. Nevertheless it is currently going up to three percent in November 2008. Apparently 46 percent of all unemployed workers are foreigners. Zurich has become a very popular work place for expats from Germany, England, USA and even India. But I am sure they will leave as quickly as they arrived once the economy turns sour. Many expats are strong spenders as they had well-paid jobs. So there absence will be felt from night life to shopping and apartments. I recently talked to a Lamborghini dealer and I was very surprised to learn that about 80 percent of all Lamborghini, Bentley and Rolls Royce buyers buy the car spontaneously. Apparently they walk into the showroom, look at the cars on display and then buy them right there and then. But I have the feeling that these spontaneous purchases might become rarer during the current recession as credit gets scarcer. I read that for example three quarter of all BWM were leased. I just hope that all those former Lamborghini drivers will not switch to the ingenious Swiss car rental system Mobility that I am using! For the first time in its over-hyped history the Smart car is producing a profit while the famous Mercedes cars are shunned. What happened? According to an article in the German weekly newspaper Die Zeit one third of all inhabitants in Paris and Tokyo do not own a car anymore. With the German car industry grinding slowly to a halt and sales dropping fast, the oil-price peak and the financial crisis are bringing the ‘bigger, faster, better’ trend in car-manufacturing to a painful end. The newest buzz-word in car-manufacturing is downsizing, or small is beautiful. Car manufacturers worldwide are now hell-bent on producing small but homely cars that feature woollen and cotton interiors instead of leather and shiny wood. 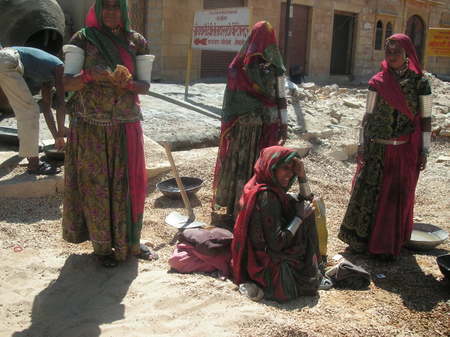 Picture: Disadvantaged Indian women working as road workers. Very poor and disadvantaged people are unwelcome customers and shunned by most companies: they do not get electricity, credit, house loans, healthcare or else. If they are lucky they receive benefits from the government or emergency aid by NGOs, and that’s about it. Really? A few years ago an economic professor, Mr. Mohamed Usus, in Bangladesh started an experiment in giving loans to very poor Bangladeshi women for their small businesses. The loans were small ranging from around 50-100$ and they had to be repaid by 2$ a month. Mr. Yunnus was surprised to learn that the loans were diligently repaid by the poor ladies even though everyone told him beforehand that they will not be repaid. He then started without government aid Grameen Bank which gives out loans to very poor people. He started to give loans for sewing machines and finally loans for houses, as many houses are used by farmers also as storage. The bank has grown rapidly over the last few years and it is completely self-financed as it charges an interest. So far it has built 600’000 houses in Bangladesh for 300$ a piece and over 25 percent of all Bangladeshi households have received a loan from Grameen Bank. Mr.Yunnus is a social entrepreneur. But what is a social entrepreneurs? They are people who have a vision of how to make the world a better place and use business models to make them real. Most often everyone else will tell them that their idea is not feasible, that the poor people will not pay for their services but despite the odds they prevail. The businesses range from selling solar panels in Brazil, providing mobile phones in India to establishing a help line in India, as David Bornstein, author of the book How to change the world told the audience at the Gottlieb Duttweiler Institute in Rüschlikon. Social entrepreneurs are not traditional NGOs as they do not raise funds for re-distribution. They use marketing to spread their idea and charge for their services and products. They compete for ideas and are not protected by the government. They tend to be small and nimble organizations and are working hard to become self-sustaining. Grassroots social entrepreneurs bridge the gap between big charities, the government and business. They compete for ideas and are exposed to market forces. No wonder that efficiency is familiar concept to them!